JOOLA Midsize table tennis table is being released lately and is soon to receive overwhelmed demand over the world. If you never heard of this company, just spend some time reading this. JOOLA is the world famous manufacturing brand for table tennis products. The company is founded in the early 1950s and the headquarter is located in Siebeldingen, Germany. A lot of high-quality products and equipment are manufactured and provided by the company to top table tennis players around the world. Improving the standard of the International Table Tennis has been unshakable faith by the company. This is the reason anyone in the table tennis field well knows of this company name. The factors that make the success of JOOLA including high standards & quality, continuous product innovation, and vertical marketing. Besides, the company also constantly communicates with the world’s outstanding players to gather information for product improvement and offering players what they are looking for. This has created a good image and status for it. The company follows a simple philosophy and perhaps this is the key to why the company is so successful. The philosophy is continuous to develop table tennis products that suit for various players. The company did promote it brand through the sponsorship of top-notch athletes and the sponsorship offered by the company is more than any other competitor. If you take a look at the JOOLA’s production line, you will see they are designed to meet the needs of the international table tennis market. Diverse manufacturing of quality table tennis tables, JOOLA table tennis table being the only designated tournament table for Olympic game for many years. In addition, because of market demand, the company also produces a variety of leisure ping pong table, rackets, rubber, clothing, shoes, etc. One of the famous products would be the midsize table tennis table. This small ping pong table is manufactured out of the same top quality material as the other lines of tables, the playing surface of the table features with 16mm (5/8 inch) and the sizes of this table is only 71 x 30 x 36 inches (W x H x D), this is only about 2/3 of the size of a standard ping pong table and it is quite similar to the height of a pool table. The company builds this table tennis table with the purpose to serve those people who want to play table tennis but have limited space in their house. It is designed to be able to separate the table into halves so that it can be easy for storage. Besides, the stand-alone table can be used for other purposes such as a playing card or dining. It is quite similar to the Butterfly junior table tennis table. 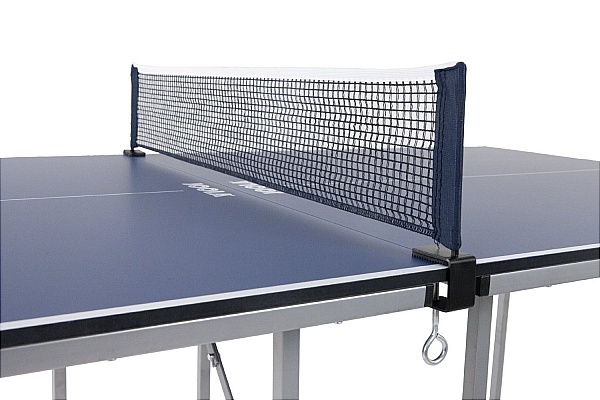 If you are looking for a table tennis table for your home but are worried about not having sufficient space to accommodate the table, then you sure should consider buying this midsize table tennis table. The table for sure can satisfy your needs and the good thing is you no need to spend a lot of money on remodeling your room. This good table is having the size of 30 inches and is come together with a net and post set. 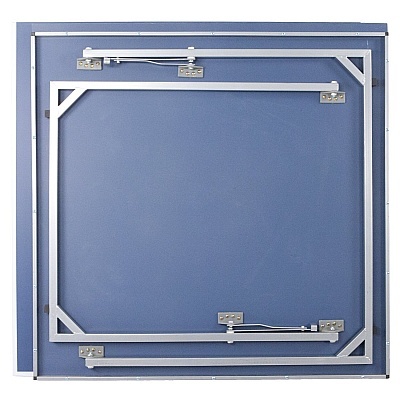 The thickness of the table top is 16mm ( 5/8 inches) and the weight is 28kg (62lbs). You may be suspicious when you first saw the table. The table is separated into 2 dividers when you first open the box. The setup is rather simple and easy. All you need to do is just joining the 2 tables and put on the net, you are done and can start playing. Besides, you can also use the table to play the game of dominoes, chess, cards, and many other things. This is really an awesome table piece for kids. The table is very well made of quality wood. It can be heavy for some people but the table is really a solid one with the best wood constructed. Also, the table will fit perfectly in your basement. With the price that you paid for this JOOLA Midsize table tennis table, you will receive high-quality craftsmanship in return. 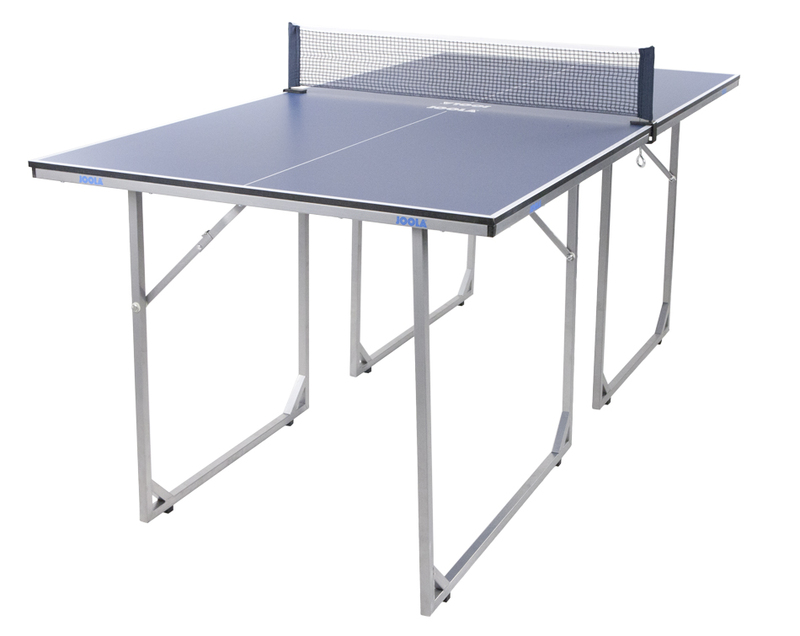 It is recommended to those who love playing table tennis but having not enough space to accommodate the standard size of a table tennis table. Superior quality table with the awesome overall look and superb performance. It is lightweight and portable. You can carry it and place anywhere you want. A good midsize indoor table which only occupied little space. Easy to assemble and keep for storage. Come with 2 pairs of sturdy fold-out legs that very helpful to lock the table into place. Required only small room size which will save your space. Ideal size for living room sport. Especially useful for winter months play. Poor packaging may incur damage to the table during the time of shipping. Its size is only 2/3 of a standard table tennis table. This table is not approved by ITTF since it is not a standard size ping pong table. If you are interested, you can find out more on Joola website for this table. There are also some suppliers that supply the table with free shipping. You will save on your shipping cost if you order from them. This is the video created by JOOLA USA which happened to be the sole agent for the company in The United States of America. I order one of this Joola midsize table from Amazon and love it when I first unbox the table. I bought it based on many reviews written at Amazon that filled with many advantages regarding this table. However, thing that make me finally bought it is the words of no construction is required. This is perfect for lazy people like me who has no sense to assemble anything. All I can said is this is an amazing table. The construction is sturdy and the cover top has a very nice bounce. I have no problem at all to set it up and take it down. The action is quite nice and every member in my family is enjoy in playing the game very much. After all, the best thing is the table is fit perfectly in our living room.